All aboard and haul anchor for a ride in the family car. 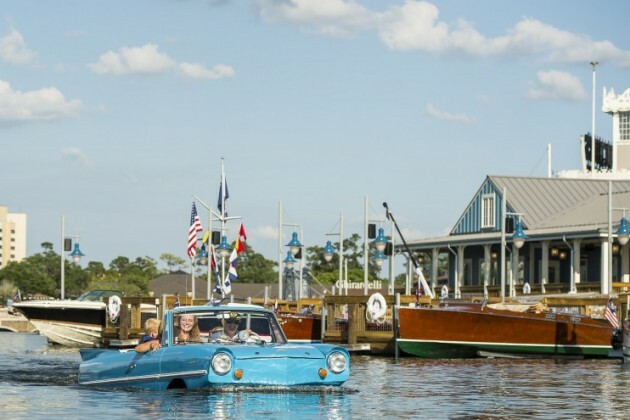 This week, Walt Disney World introduced a unique driving experience with the opening of The Boathouse at the Downtown Disney entertainment district. The restaurant features a delectable raw bar complete with oysters, and five-star desserts to-die for. But so what. Around back is what we’re really interested in. Amphicars. 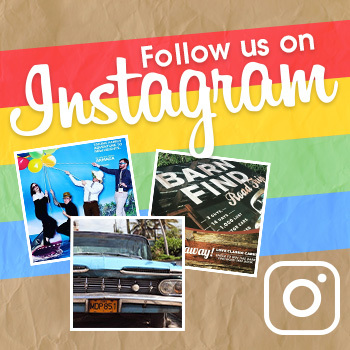 Any car enthusiast with a smartphone has had at least a fleeting Google glance at these modern marvels. While only a few thousand were sold in their heyday, regular amphicar ‘swim ins’ still happen all over America. But for the land-lubbers like you and me, the opportunity to careen straight into a lake without consequences just hasn’t been accessible; until now. Because ‘Coat’ and ‘Bar’ were already taken: amphicar. 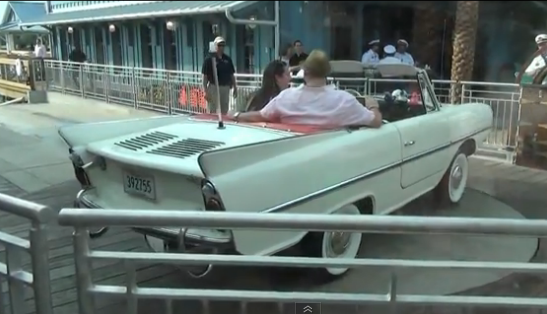 Up to three passengers can load up in the backseat for an amphicar tour of Downtown Disney’s Lake Buena Vista. Tours are $125 for 20 minutes of moisture invincibility, so find two buddies and split the tab. Though they are the salamanders and frogs of the automotive world, Disney don’t want no scrubs. These are meticulously-detailed classic amphicars from the 1962-1967 era; pinstripes, fins, and all. 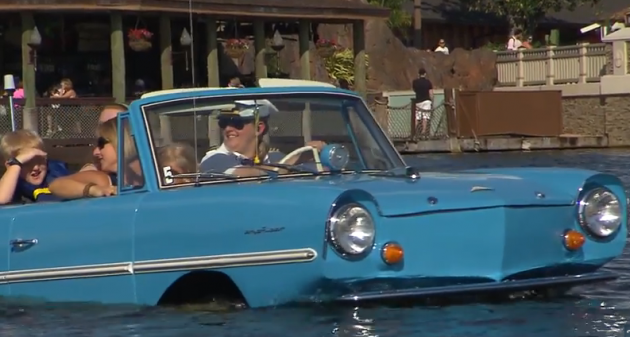 While we aren’t sure what kind of special modifications have been made (as Disney tends to do), these are Amphicar 770s, typically capable of up to 70 mph on land and 6 knots in the lake. Guests will enter the car on land, with a good length of ramp leading up to the water. This is a guided tour, so the Car Captain will do all of the driving. As the car slowly approaches the edge of the water, ignore that little voice in your head that has told you for years that you shouldn’t drive head-long into a lake. Remember, this cost 125 bucks, so sap every second of enjoyment out of that splashdown. 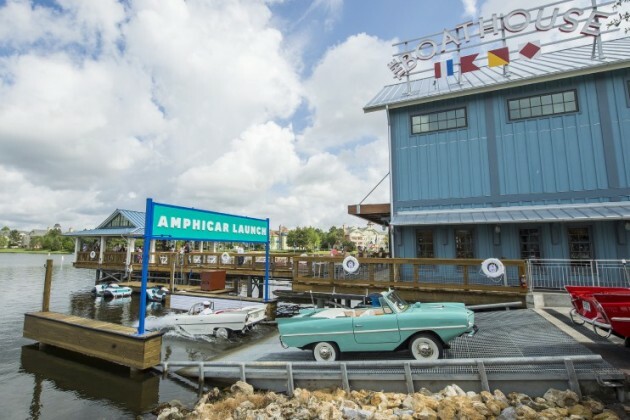 Amphicar rides at The Boathouse restaurant in Downtown Disney. Your Captain will offer tidbits about the lake during your tour, and will most likely be a chatty Cathy, if his extensive Disney brainwashing training has anything to do with it. To really get him going, try asking your Captain what kind of license he needs to drive one of these, or if he’s ever been pulled over. Rides on Lake Buena Vista are truly beautiful, with all of Downtown Disney in view and Saratoga Springs Resort across the lake. “After 20 minutes of motoring on the water, your skipper will navigate back to The Boathouse dock, driving up to a rotating platform that will give you one last showroom spin,” according to BestArny. Dock turnstile: Not fast enough to dry anyone. Amphicar rides last until 10pm, and a twinkling nighttime tour is vastly different from a daytime jaunt. The Boathouse will be the only restaurant at Downtown Disney that serves food until 2am, with a full-service bar out on the dock where you can snack, drink, and take in the view. The twenty-one museum-quality boats at the dock are outfitted with custom lighting for an enchanting effect on the waters at night.